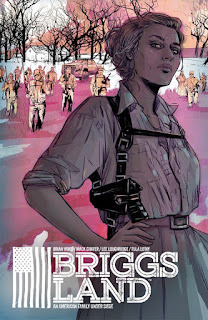 MILWAUKIE, OR— From New York Times best-selling writer Brian Wood (The Massive, Rebels, DMZ, Channel Zero) comes an electrifying crime saga relevant to current world events: Briggs Land. The new ongoing comic series is set to begin in summer 2016, with interior artist Mack Chater (Ashes, Six), cover artist Tula Lotay (Rebels), and Hugo Award–nominated colorist Lee Loughridge bringing Wood’s script to life on the page. Brian Wood is the creator/co-creator and writer of numerous comic books and graphic novels, including DMZ, The Massive, Channel Zero, Demo, The Couriers, Northlanders, Rebels, and Briggs Land. He co-wrote the video game screenplay for 1979 Revolution. His work on company-owned and licensed work includes Star Wars, The X-Men, Conan The Barbarian, and Aliens. He is most known for work dealing with near-future world building, but also for historical fiction, scifi, and female-friendly YA, all with strong socio-political topics and identity themes. Brian lives in Brooklyn, NYC with his family.